Welcome to the website of the European Parliament's Delegation for relations with Israel (D-IL). As the elected Chair of the Delegation, I preside over our regular meetings in Brussels and Strasbourg and set the agenda for our work with our partners in the Israeli Knesset. During this term of the European Parliament, while respecting the independence of our partner parliaments, we'll be working to ensure that the European Parliament's position is taken into account, in the case of Israel, in all policy areas pertaining to our relations with the State of Israel. In addition to our regular meetings within the European Parliament in Brussels and Strasbourg, we also hold inter-parliamentary meetings (IPMs) with our counterparts in the Knesset. These meetings contribute to further strengthening the relations between the EU and the State of Israel, thus improving our mutual understanding, but also strengthening our vital partnership. As one of the "diplomatic arms of the European Parliament", the Delegation for relations with Israel contributes to representing the European Union in Israel and to promote the values on which the European Union is founded. I look forward to guiding our delegation through the current, challenging times. The 43rd Inter-Parliamentary Meeting between the European Parliament and the Israeli Knesset was held on 31 October 2017 in Jerusalem. 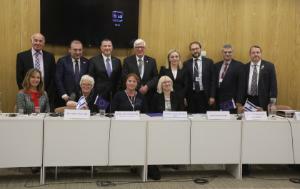 The Members of the two delegations exchanged views on the state of play of relations between the European Union and the State of Israel with a special emphasis on the current common security challenges in Europe and in the Middle East, the fight against terrorism, combating the rise of anti-Semitism, the Middle East Peace Process, and other issues at stake within the framework of the Union for the Mediterranean - European Neighbourhood Policy.